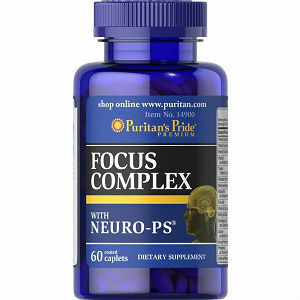 This article is a review of the supplement Puritan’s Pride Focus Complex. This product contains several nutrients that can protect your brain from damage. It works by neutralizing free radicals that damage cells. Continue reading this review to learn more about Focus Complex. Adults are advised to take 4 caplets per day with a meal. Pregnant women and nursing mothers are warned against consuming this product. The same applies to persons under 18 years, persons under medication, and anyone with a medical condition. The manufacturer recommends that you should stop taking the product and consult a physician in case you experience adverse reactions. This advice implies that there are chances of experiencing some negative effects after consuming the product. However, the manufacturer has not stated the actual side effects that might occur to eligible users of the product. Accidental overdose is fatal for children under the age of 6 due to amount of iron contained in the product. Therefore, this product should be kept away from children. The price of one bottle containing 60 caplets costs $13.99 on the official website. The same bottle costs $6.30 on Amazon.com and a shipping cost of $2.95 is applicable. You can take advantage of the discounts offered by the manufacturer on the official website. You can purchase three bottles for $20.97 ($6.99 per bottle) or five bottles for $27.95 ($5.59 per bottle). In general, the price of Focus Complex is very low compared to the prices of related products. A low price is likely to prompt quality concerns among potential buyers. The manufacturer provides a satisfaction guarantee. You can have all your money refunded if the product does not meet your needs. A guarantee indicates that the manufacturer is sure that you will be satisfied with the results. We presume that Focus Complex is a quality product. We were able to identify positive customer reviews, which indicate that users are satisfied with the results. These reviews are on the company’s website and Amazon.com. Based on the acquired information, Focus Complex can help in protecting your brain in addition to performing other function. This product uses a combination of trusted ingredients, especially vitamins that are essential for normal brain and body functions. It is also motivating to know that the manufacturer offers a money-back guarantee, which increases the confidence of potential users. Moreover, there are valid customer reviews from different sites showing that most users are happy with the results. However, we cannot ignore the pitfalls associated with this product. The price is very low. Consumers may relate the low price to low quality. Furthermore, there are chances of experiencing adverse effects after consumption. Additionally, accidental overdose may cause death in small children. Henry Costa	reviewed Puritan’s Pride Focus Complex	on June 29th	 and gave it a rating of 3.5.